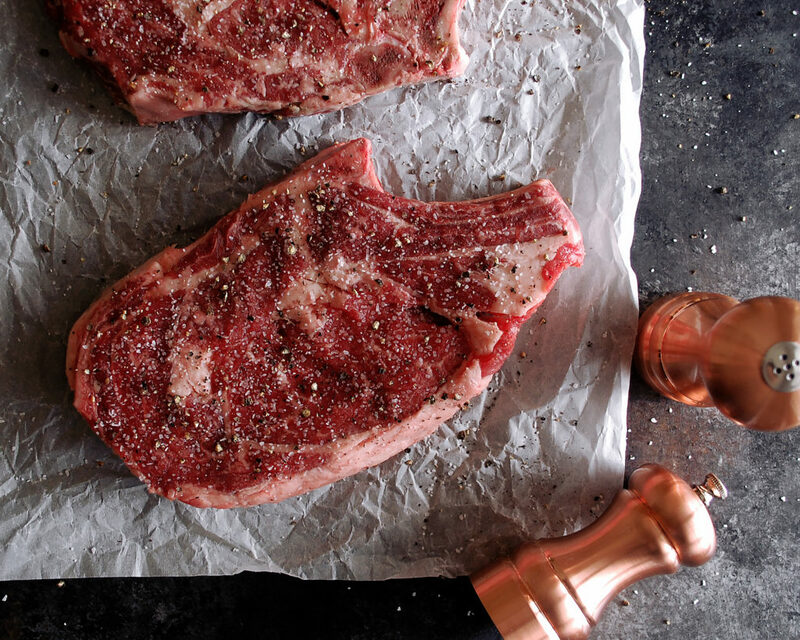 Learn the step-by-step process for cooking a perfectly seared steak. I recently started a “how-to” series to document some of the fundamental cooking methods that I have learned. Because without a good foundation, even the best ideas can fail in the kitchen. We started by going through the process of making crispy French fries, which is basically the same process you can use to fry just about anything. 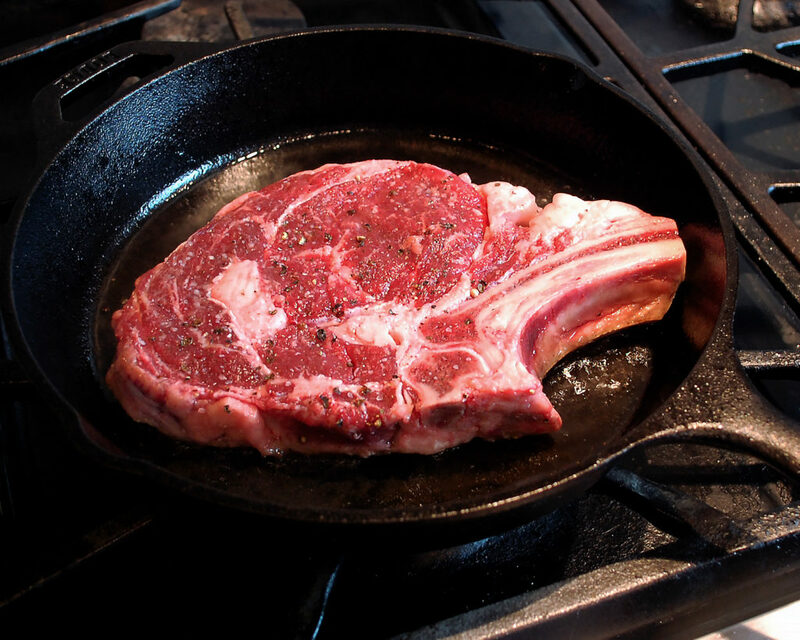 Now, let’s talk about searing steaks. 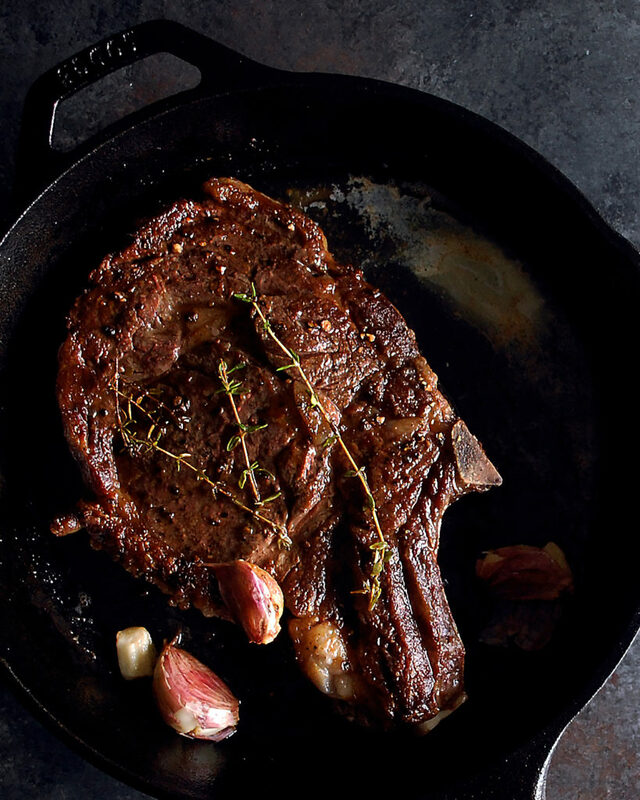 Another seemingly simple thing to do, but there are some key steps that can’t be missed to ensure a really beautiful crust and a tender, juicy steak. I’d say some of the most common mistakes would be not getting the meat dry enough and not letting the oil get hot enough. Overcrowding the pan can also result in a poor finished product…basically a somewhat soft, spotty steak. So, what should you do? 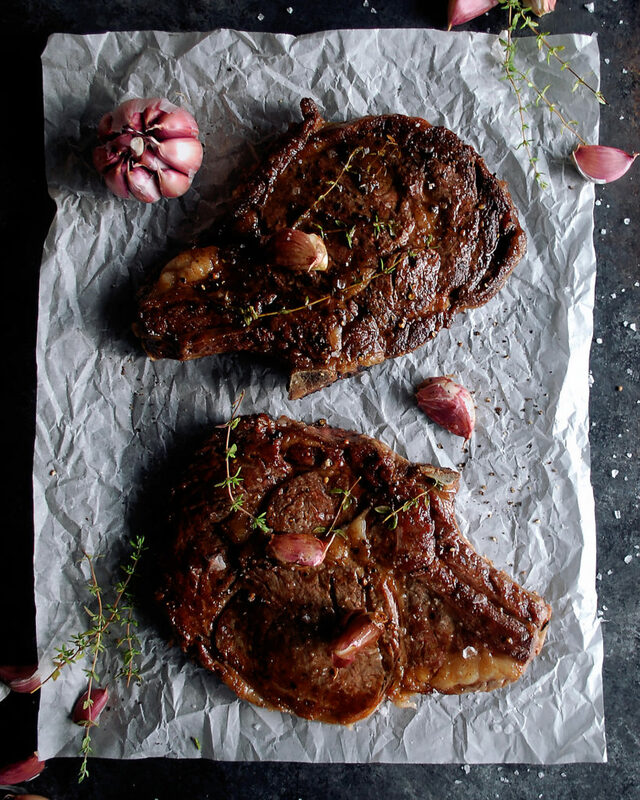 Follow along below to find out how to cook a perfectly seared steak! 1. 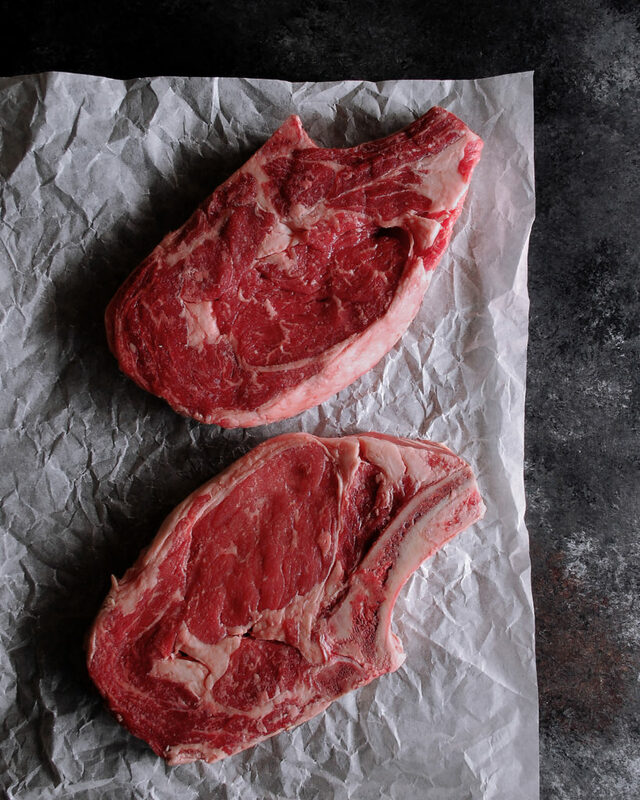 Start with a tender cut of meat, such as a tenderloin, strip loin, or ribeye. 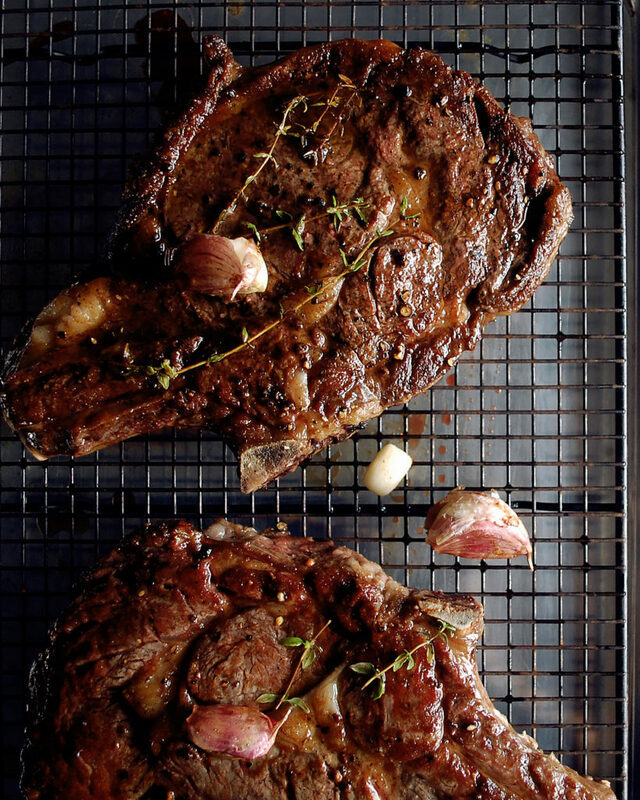 Here I’m using ribeye steaks that have beautiful marbling, which adds rich flavor. 2. Let the meat sit out at room temperature for a good 30 minutes. This allows the meat to relax and essentially prepare for the shock of the heat. 3. 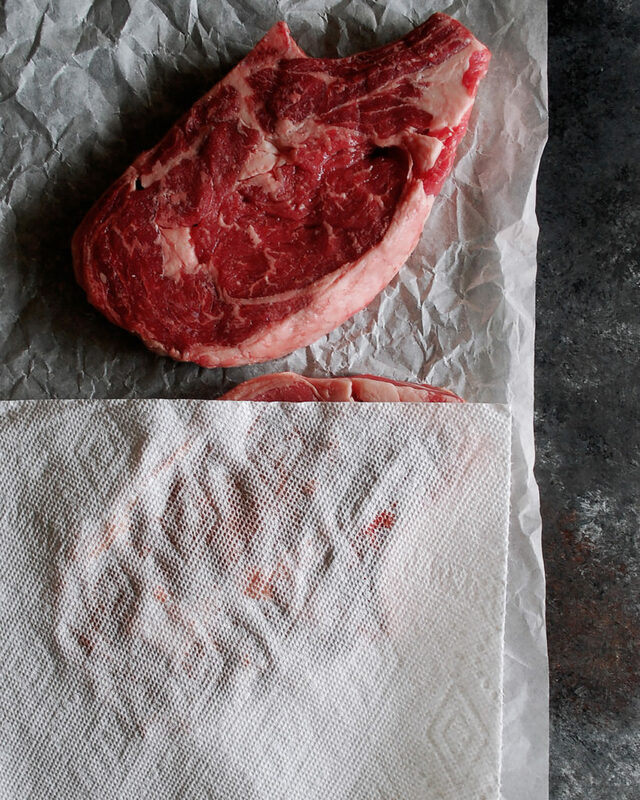 Use paper towels to pat the meat dry on all sides. You want the meat to be completely free of moisture before hitting the pan. 4. Season the meat very well. A little bit more than you would normally think. This is how the flavor of the meat is going to come through. And that is exactly what you want here. Intense meat flavor. 5. Heat a cast-iron skillet over medium heat first. Then add the oil. Use an oil with a high smoke point such as vegetable oil. And don’t use too much, just enough to coat the bottom of the skillet. Stick with medium heat and be patient while it heats up. 6. Make sure the oil is sizzling hot before adding the meat. I like to test a breadcrumb in the oil to make sure it sizzles. 7. Add the steak to the skillet. If adding more than one, make sure the skillet is large enough so each piece of meat has a good amount of space around it on all sides. If you overcrowd the pan and the steaks are too close, they will steam and you will end up with soggy sides instead of a golden crust. Work in batches if needed. 8. Once the steak hits the oil, leave it alone. Don’t start messing with it and trying to lift it up to see if it’s done. The meat will stick to the pan. Instead, wait 5 minutes before touching the meat. 9. 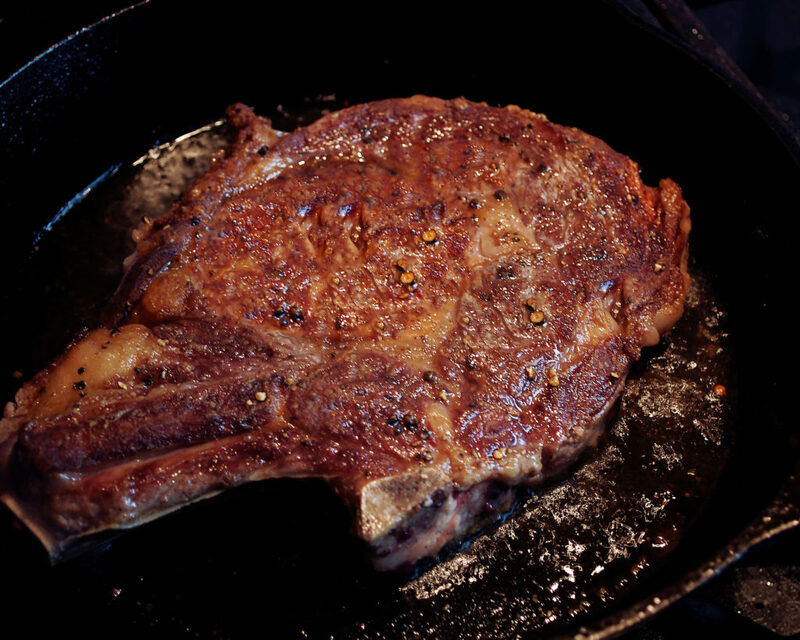 Once the first side has a really good sear, flip the steak over. Make sure to flip it away from you so the oil does not splatter towards you. 10. Immediately transfer the skillet to a 375F oven for 3 minutes. 11. Return the skillet to the stovetop over low heat. 12. Add 2 tablespoons of butter, fresh thyme, and smashed garlic cloves. 13. As the butter melts, use a spoon to “baste” the steak. Tilt the pan towards you and continually spoon the butter over the steak. 14. Use your fingers to feel the meat. For medium rare, it will feel soft but have a firm bounce. You can also use a thermometer to ensure the steak is at your desired doneness. If it’s not, baste the steak longer. 15. Transfer the steak to a wire rack and spoon the remaining butter over top. 16. The last and most important step is to let the meat rest. It should rest for at least 10 minutes before slicing so the juices can redistribute and remain inside the steak instead of all over your cutting board. 17. Once rested, the steak is ready to serve! Slice it or serve it whole. And there we go! A perfectly seared steak. Make sure the meat is dry and seasoned well. Make sure the oil is sizzling hot before the meat touches the pan. Don’t mess with the steak when it first hits the oil. Always, always let your steak rest for at least 10 minutes before slicing. 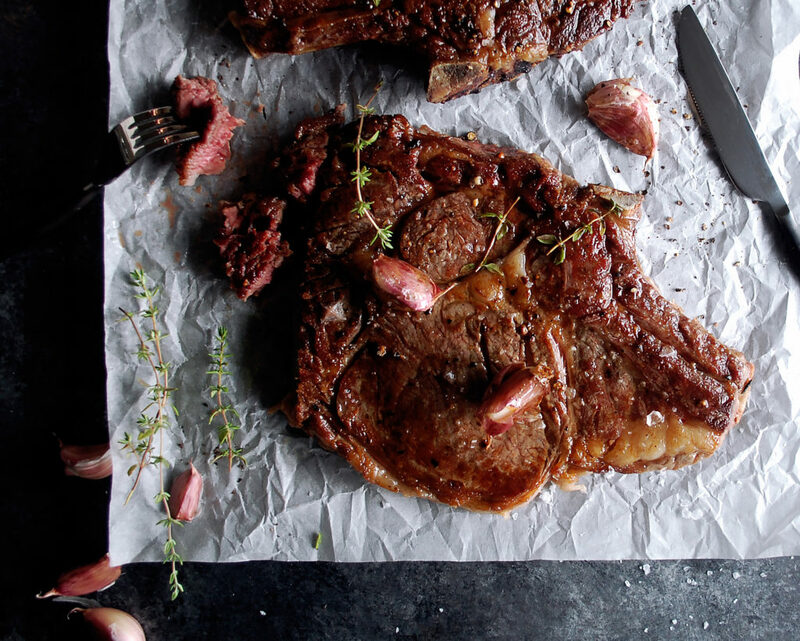 Oh, there are just so many ways to dress up a steak. A fun spice rub, a good sauce, a flavored butter, some really delicious side dishes…the options are endless. I like to keep things flavorful and simple like a red wine reduction. Or even a rosemary sea salt butter. Maybe a mushroom polenta to serve alongside? I’m getting hungry just thinking about it! Thank you!! 🙂 Super delicious and simple!